The Peugeot Instinct will never reach production. That needed saying, just to get that bitter pill of disappointment out of the way, now you’ve taken a look through the pictures. It’s a shame, yes, but Peugeot has bigger fish to fry; DS is doing the premium leg work now and, with a growing range of ever-more-promising mass-market cars to manage, it has its hands full as it is. 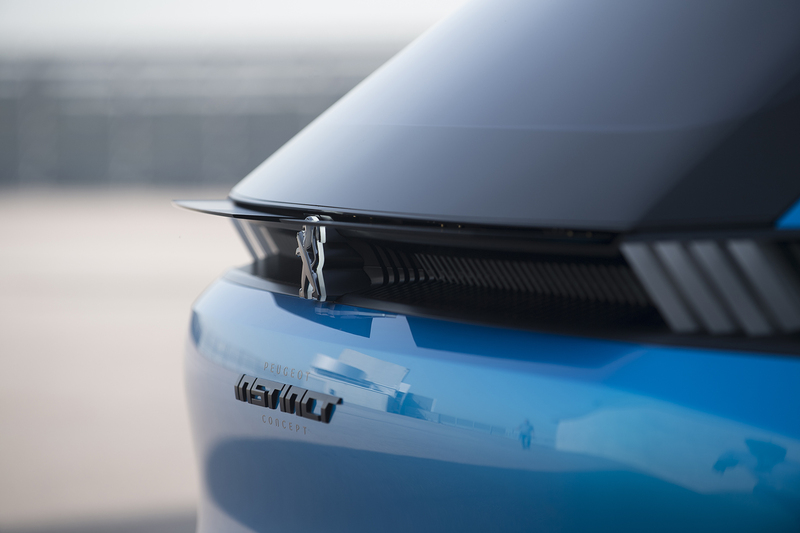 The Instinct also follows the Oxia, Fractal, Onyx and a long chain of other Peugeot concepts over the years that promise everything but production. What could make it to production, however, are elements of the concept in trickle-down style, such as interior details, styling cues or less concrete things such as philosophies (more on this later). If we’ve lost you with that last bit, bear with us; the Instinct could be the car to rescue automotive excitement from the Armageddon that some view full autonomy as. See, the Instinct concept has selectable drive modes, Soft and Sharp, and there’s also scope for downloadable autonomous driving modes, so customers could be driven to work by a simulated Sébastien Loeb, for example. It’s not geared up for full autonomy and the outlawing of driving, though; the steering wheel, more of a spaceship-like arc shape, comes out of its place in the dashboard when one of the drive modes that actually involve driving is selected. As a passenger car, despite the huge, rear-hinge doors at the back and conventionally opening front doors, it’s fairly tight inside. This is alleviated by lots of glass, light and crisp-feeling materials and lots of screens, as well as a relatively low dashboard. However, there’s no denying that head room is fairly tight; unusual for a car Peugeot compares to an extension of the owner’s home when in autonomous mode. Still, this makes for an incredibly sporty feel, with a nod to the RCZ in the two glass strips along the roof, which helpfully add a little head room. Although this seems at odds with the car’s aim, Peugeot let loose with the Instinct. And with no production plan, it’s as out there as possible. 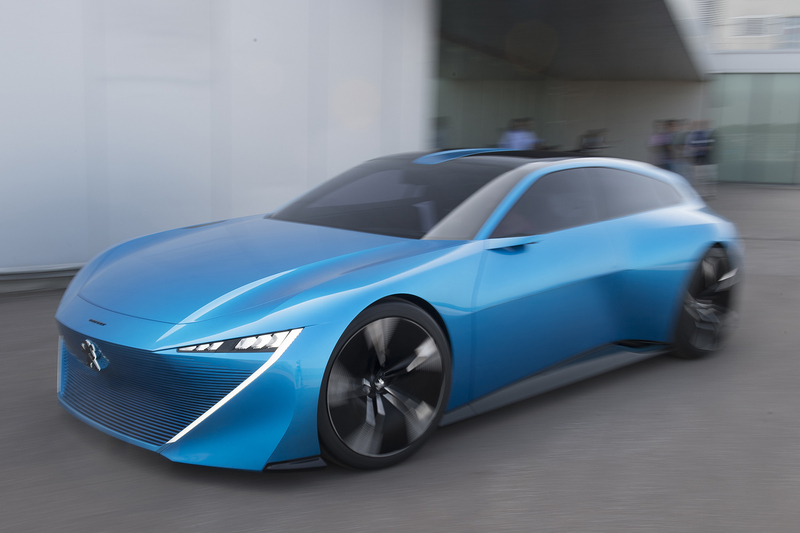 Peugeot’s head of concepts and advanced design, Matthias Hossann, said that although the car won’t go into production, he hopes that some of its elements will in the future. These include alternatives to leather, such as the trainer-inspired fabric used for the seats and the ultra-reflective green chrome trim used for some interior components. More outlandish features, such as the thin layer of concrete incorporated into the car’s floor, are less likely to feature on the 108 in a few years’ time. Even less likely to see the light of day is the rakish exterior. While the car was designed from the inside out, with autonomy in mind, that didn’t stop Peugeot from creating an exterior that lives up to its pedigree of tragically unattainable but visually delicious concepts. More likely to reach production is the ‘i Device’, a centrally mounted controller module for Peugeot’s iCockpit system with drive mode selectors and finished in perforated leather. This sits in the ‘Hands’ portion - the mid-section of the car level with the space between waist and shoulder. 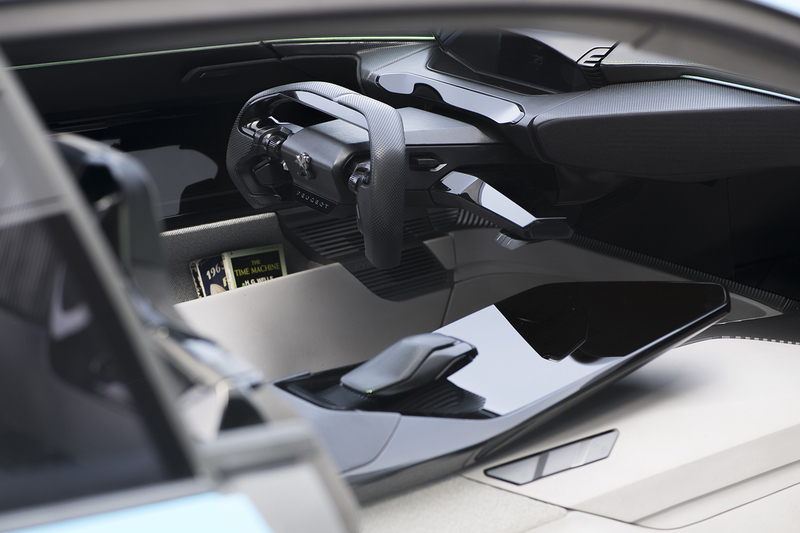 These are the parts of the car you interact with, predictably, by touch. ‘Eyes’ is from the shoulder up, so there’s glass aplenty and design elements at eye level, as well as a digital rear-view mirror. The lowest ‘Body’ segment of the car is designed for comfort: figure-hugging seats, a roomy footwell and interior appointments all make the car feel “really like home”, according to Hossann. The term 'cliff edge' is something of a term du jour, but Peugeot has aimed the Instinct squarely at the cliff edge between human-driven cars and driverless ones, while the world wonders what will happen as one wanes and the other waxes. Peugeot couldn’t demonstrate the four drive modes or even the autonomous modes – it’s a concept, after all – on our low-speed, electric-only drive, but as long as ideas like those displayed on the Instinct are nurtured, there’s hope for the driver’s car yet. I'm not a fan of leather, particularly for car seats, so I welcome them looking at alternatives. Hopefully it makes it beyond the concept stage.